To accelerate the LAMP reaction, loop primers act from the elongation steps of the original LAMP reaction (Fig. 2, lower). 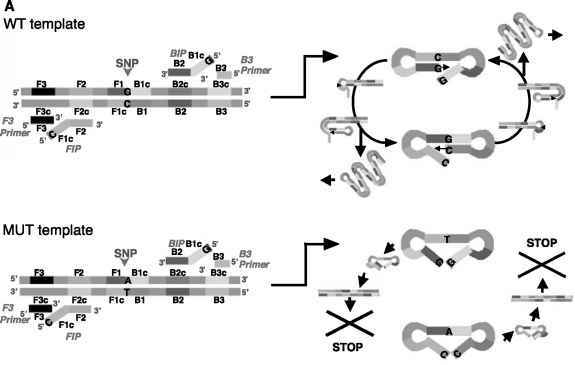 The loop primer called loop B hybridizes to single-stranded loop region of the stem-loop DNA in structure 9 before initiating strand displacement DNA synthesis. Then, DNA synthesized from this loop primer is displaced by extension from the 3' end of the target DNA, generating structure 11, which is not created in the original LAMP reaction. Structures 6 and 8 generated by loop primers are also obtained in the original method and are reused in the LAMP reaction. 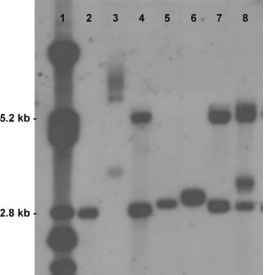 All of the stem-loop DNAs are used by either the inner or loop primers, e.g., structures 14, 15, and 16. The loop primers hybridize to the stem-loop region in structure 9, as well as in the other structures that are generated by the LAMP reaction, resulting in dramatic amplification.